Tombs and burials are a rich source of information about Etruscan life and culture. The Etruscan dead could be cremated or buried. But regardless of which method they chose, their remains were always placed underground. 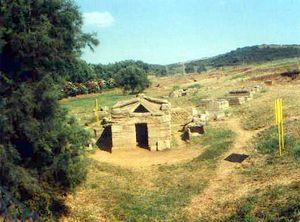 Etruscan tombs were constructed from natural bedrock or tufa blocks. Their décor and layout are a rich source of information about Etruscan attitudes to death. They also offer a vital insight into Etruscan life. Throughout the Etruscan period, both inhumation and cremation were popular burial methods. Cremation was the first common burial method, with inhumation becoming fashionable during the Orientalising period. Burial practices were also localized. Cremation remained popular throughout the Etruscan period in northern Etruscan territories. Inhumation, which first began to appear in towns such as Tarquinia and Caere in the fifth century BC, remained a largely southern Etruscan phenomenon. Cremated remains were placed inside metal or pottery urns. Elaborately carved urns were also used, such as the alabaster urns found in the northern Etruscan town of Volterra, Tuscany. Cremated remains could also be interred in sarcophagi, as were inhumed remains. Inhumation generally involved wrapping the body in linen cloth before placing it in a terracotta sarcophagus, on a stone or wooden funeral couch or a stone or wooden chest. Whatever the method of burial, the remains of the deceased would then be placed in a tomb. Like the Romans, the Etruscans buried their dead away from the living, outside city walls in cemeteries. Etruscan tombs were built underground, carved out of natural bedrock or else built from blocks of tufa. Quite often, they were invisible from the surface although it became popular to mark some communal tombs with a tumulus. The best example of this kind of tomb can be found in the cemetery at Cerveteri at Caere. Here, the tombs were rock cut and marked with tumuli of up to 33 metres in diameter. Streets ran between the tumuli and can still be seen, bearing the marks of wheel ruts. These tumuli could well have acted as monuments for individual family groups. The decoration and layout of Etruscan tombs reveals a great deal about attitudes to death. They preserve details of funeral rites, including funeral feasts, processions, the gods of the underworld and the games used to commemorate the dead. Tomb paintings suggest that gladiatorial contests could have had their origin in these funeral games. The interiors of tombs were often designed to replicate household features, providing a valuable source of information of domestic architecture otherwise lost from the archaeological record. Many early tombs had gabled roofs, and were set out in a series of rooms, connected by doorframes or with window frames cut into the partition walls to allow a view between rooms. Many had rooms set out like dining rooms or bedrooms leading off from the main burial chamber. The Tomb of the Hut is an early example. Dating from the seventh century BC, its main chamber reproducing the interior of an early Etruscan hut with its sloping roof and a smaller side chamber styled like an early bedroom. Tombs also included architectural features such as porches and columns. Walls could be covered with stucco reliefs or carvings of household tools and implements such as kitchen equipment. The Tomb of Shields and Chairs, a sixth century tomb from the cemetery of Cerveteri included stone chairs around the edge of the room and round shields adorning the walls. It also includes tufa beds with semi circular bed heads for male beds and triangular ones for females. Gates, C, (2003) Ancient Cities: The Archaeology of Urban Life in the Ancient Near East and Egypt, Greece and Rome. Routledge: London and New York.